A Marxist, homosexual atheist is a potent combination, and the works of Pier Paolo Pasolini are frequently as thought provoking and problematic. 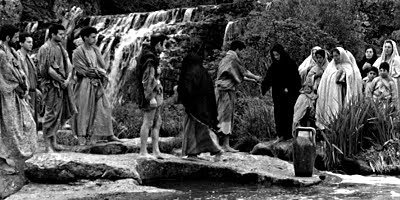 Pasolini's lack of belief in the divinity of Christ allowed him to present a more authentic, and perhaps class-conscious, account of Matthew's gospel than previous, more sanctimonious efforts. Stunning, harsh cinematography, often filming into the sun, and simple shot composition outweigh the variable acting standards of the mainly amateur cast. Then non-actor Enrique Irazoqui is an atypical, human Jesus, seen slogging around a dusty, arid Palestine. By avoiding the usual cliqued Renaissance-type imagery, Pasolini gives us a more accessible figure, closer to the working men and women who made up his flock in the early days. The miracles are dealt with in an offhand way, which would be mirrored decades later in Scorsese's Last Temptation of Christ, and even the voice of Yaweh Himself appears without Cecil B. DeMille-style fanfare. Matthew is a rare beast: a religious film which can be enjoyed artistically by the secular and devotionally by the churchly.